Foxborough, Mass. - A 25-year-old quadriplegic sits in a wheelchair with wires coming out of a bottle-cap-size connector stuck in his skull. The wires run from 100 tiny sensors implanted in his brain and out to a computer. Using just his thoughts, this former high school football player is playing the computer game Pong. It is part of a breakthrough trial, the first of its kind, with far-reaching implications. Friday, early results were revealed at the American Academy of Physical Medicine and Rehabilitation annual conference. Cyberkinetics Neurotechnology Systems, the Foxborough-based company behind the technology, told attendees the man can use his thoughts to control a computer well enough to operate a TV, open e-mail and play Pong with 70% accuracy. "The patient tells me this device has changed his life," says Jon Mukand, a physician caring for him at a rehabilitation facility in Warwick, R.I. The patient, who had the sensors implanted in June, has not been publicly identified. The trial is approved by the FDA. Cyberkinetics has permission to do four more this year. The significance of the technology, which Cyberkinetics call Braingate, goes far beyond the initial effort to help quadriplegics. It is an early step toward learning to read signals from an array of neurons and use computers and algorithms to translate the signals into action. That could lead to artificial limbs that work like the real thing: The user could think of moving a finger, and the finger would move. "It's Luke Skywalker," says John Donoghue, the neuroscientist who led development of the technology at Brown University and in 2001 founded Cyberkinetics. Further out, some experts believe, the technology could be built into a helmet or other device that could read neural signals from outside the skull, non-invasively. The Defense Advanced Research Projects Agency (DARPA) is funding research in this field, broadly known as Brain Machine Interface, or BMI. DARPA envisions a day when a fighter pilot, for instance, might operate some controls just by thinking. DMI is a field about to explode. At Duke University a research team has employed different methods to read and interpret neural signals directly from the human brain. Other research is underway at universities around the world. Atlanta-based Neural Signals - a pioneer in BMI for the handicapped - has also been developing a system for tapping directly into the brain. To be certain, the technology today is experimental and crude, perhaps at a stage similar to the first pacemaker in 1950, which was the size of a boombox and delivered jolts through wires implanted in the heart. The Cyberkinetics trial "is great," says Jeff Hawkins, author of On Intelligence, a book about the brain out this month. But measuring enough neurons to do complex tasks like grasp a cup or speak words isn't close to feasible today. "Hooking your brain up to a machine in a way that the two could communicate rapidly and accurately is still science fiction," Hawkins says. Layered on all of the BMI research are ethical and societal issues about messing with the brain to improve people. But those, too, are a long way from the research happening now. The Cyberkinetics technology grew out of experiments with monkeys at Brown. Donoghue and his research team implanted sensors in the brains of monkeys, and got them to play a simple computer game - chasing dots around a screen with a cursor using a mouse - to get a food reward. As the monkeys played, computers read signals from the sensors and looked for patterns. From the patterns, the team developed mathematical models to determine which signals meant to move left, right, up, down and so on. After a while, the team disconnected the mouse and ran the cursor off the monkeys' thoughts. It worked: The monkeys could chase the dots by thinking of what they'd normally do with their hands. A driving concept is to make the computer control natural, so a patient doesn't have to learn new skills. 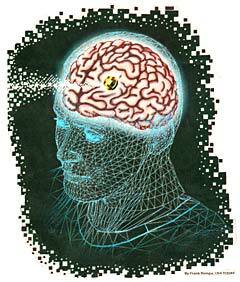 The reason it works has to do with a discovery made by neuroscientists in the 1990's. The billions of neurons in each region of the brain work on physical tasks like an orchestra, and each neuron is one instrument. With an orchestra, if you listen to only a few of the instruments, you could probably pick up what song is being played, but you wouldn't get all its richness and subtlety. Similarly, scientists found that if you can listen to any random group of neurons in a region, you can decipher generally what the region is trying to do - but you wouldn't get the richness and subtlety that might let a person do complex tasks. The more neurons you can listen to, the more precisely you can pick out the song. Cyberkinetics' big breakthrough is listening to up to 100 neurons at once and applying the computing power to make sense of that data almost instantly. The 100 sensors stick out from a chip the size of a contact lens. 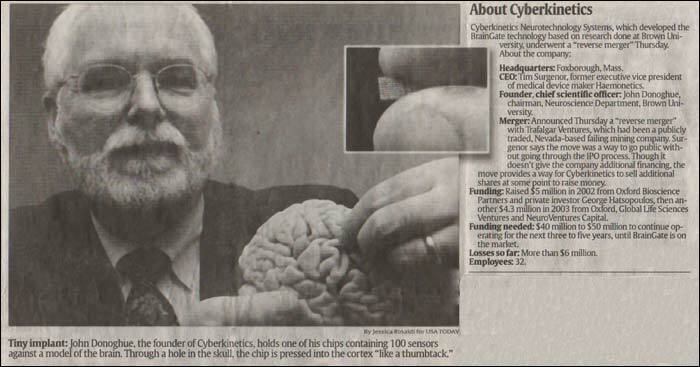 Through a hole in the skull, the chip is pressed into the cortex surface "like a thumbtack." Donoghue says. Most of the sensors get near enough to a neuron to read its pattern of electrical pulses as they turn on and off, much like the 1s and 0s that are the basis for computing. 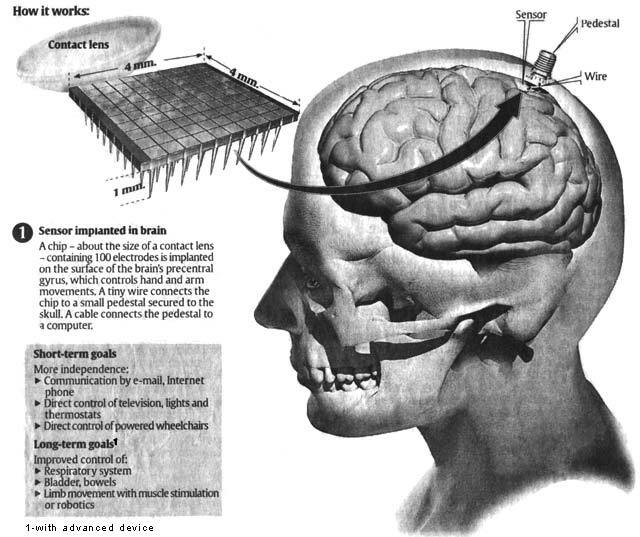 Wires carry the signals out through a connector in the skull, and the computer does the rest. Cyberkinetics technicians work with the former football player three times a week, trying to fine-tune the system so he can do more tasks. He can move a cursor around a screen. If he leaves the cursor on a spot and dwells on it, that works like a mouse click. At this point, though, the equipment is unwieldy. The computer, two screens and other parts of the system are stacked on a tall cart. The processor and software can't do all the computations quite fast enough to move the cursor in real time - not instantly, the way your hand moves when you tell it to move. And because the sensors tap no more than 100 neurons, the cursor doesn't always move precisely. That's why a one-time athlete can play Pong at only 70% accuracy. Though implanting a chip in the brain might seem alarming, devices are already regularly implanted in brains to help people who have sever epilepsy, Parkinson's disease or other neurological disorders. "We put drugs in our brains to improve them, even caffeine," says Arthur Caplan, head of the Center for Bioethics at the University of Pennsylvania. "I don't think the brain is some sacrosanct organ you can't touch." Not everyone is a fan of Cyberkinetics' human trials. "I am very skeptical," says Miguel Nicolelis, co-director of the Duke center doing similar research. "They seem to want to simply push their views and make a buck without much consideration of what is appropriate and safe to suggest to different patients." At the moment, though, "The patient is very, very happy," says Mukand, who is also functioning as the FDA's investigator on the case. One way or another, neuroscience and technology are crashing together. 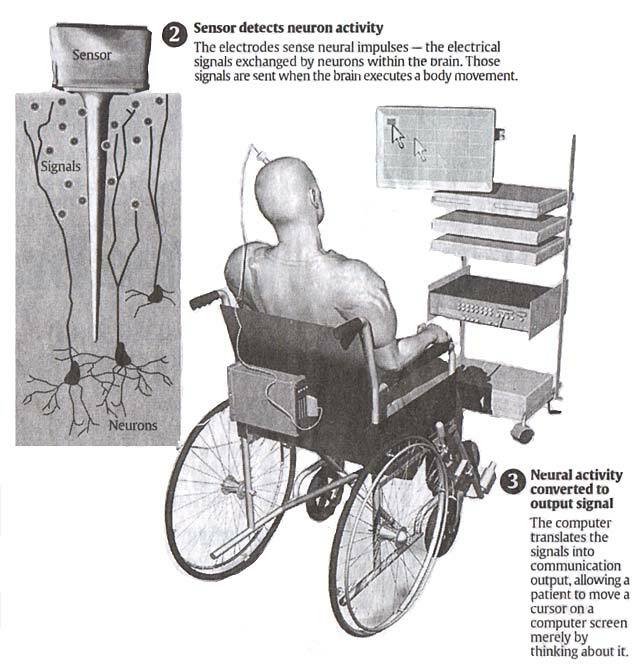 The Duke team has not implanted a permanent device in a human, but it has implanted sensors in monkeys who then move a robot arm by thought. Duke's results, published in July in the journal Neuroscience, show that the idea of using neurons to guide a prosthetic device can work. To really be useful, the technology will have to get smaller, cheaper and wireless - perhaps a computer worn behind the ear. Down the road, it will have to tap many more neurons, and then the challenge will be building software to analyze more complicated patterns from so many more neurons. "Brains are incredibly complex organs," author Hawkins says. "There are 100,000 neurons in a square millimeter of cortex. There are very precise codes in the neurons. The details matter." A yet bigger challenge - the one DARPA faces - will be reading neural signals without drilling holes in people's skulls. Over the past decade, researchers have used the electroencephalogram (EEG) to pick up brain waves through electrodes attached to the head. After months of training, users can learn to play simple video games - such as making a wheel turn faster - with their thoughts. But EEG readings are too broad and weak to drive more specific tasks. In June, researchers at Washington University, St. Louis, reported using a different external device - an electrocorticogarphic (ECoG) - to get more precise reading from outside the head. With a few hours of training, users could track targets on a screen. But researchers at Duke, Brown and Cyberkinetics believe that the only way to get signals that can operate a robot arm, do e-mail or move a wheelchair is to touch the brain directly. As with most technological developments, the devices will get smaller and better and the software will be made smarter, until some of what now seems bizarre becomes real. Society will be forced to debate the questions the technology raises. "There are those who say this is slippery slope stuff - that this technology is opening the door to dangerous technologies that could enhance, improve and optimize someone," says bioethicist Caplan. "But I'm unwilling to hold hostage this kind of exciting medical research for those kinds of fears."